In a world becoming more fragmented each day this is a gentle reminder that we need to be more conscious of the earth that sustains us. Our relationship with each other begins with our relationship with nature and our environment. We ignore both at our peril. 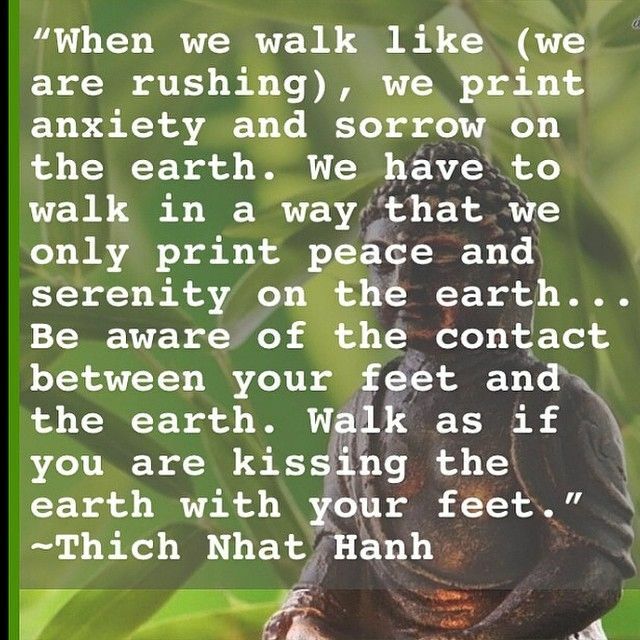 This entry was posted in Quotes, Spirituality & Religious Writings and tagged anxiety, earth, feet, kissing, peace, quotes, rushing, serenity, sorrow, spirituality, Thich Nhat Hanh, walking on July 6, 2016 by Ray Buchanan. One of the attributes of those who care enough to act is a deep-seated sense of responsibility. I will be the first to say that a sense of responsibility is a good thing. However, a strong sense of responsibility is often accompanied by the great temptation to bear the entire load of responsibility alone. And there is nothing good or noble about that. It can actually be debilitating. Working together is the path to accomplishing great deeds in any field. Sharing the work lightens our load, and just as importantly, it allows others to contribute. And that’s a good thing. But, at the end of the day, as Hugo writes, we can go to sleep in peace. The Creator of the entire universe, the God who sustains each of us and the world we call home, is awake. We do not have to carry the burdens of the work alone. We don’t have to shoulder all the responsibility. This entry was posted in Hunger & Poverty, Quotes and tagged alone, burdens, courage, God, patience, peace, responsibility, sleep, sorrow, temptation, Victor Hugo, working together on April 16, 2015 by Ray Buchanan. I am constant in my admonitions that we are fooling ourselves if we claim to love God and do not love one another. This is biblical, and has been the subject of thousands of sermons down through the centuries. There can be no love of God without our loving those around us whose needs and whose sorrows are ever before us. No amount of prayer, bible study or worship can get us around that simple fact. Loving God means loving those closest to us. Oh, and when we do, we won’t need to talk about how much we love God. We will be demonstrating it. This entry was posted in Hunger & Poverty, Quotes, Spirituality & Religious Writings and tagged bible, God, hunger, poverty, prayer, Saint Augustine, sorrow, spirituality on February 26, 2013 by ray.